Due to exceptional demand, the organisers of this year’s Pavestone Rally have decided to re-open the entry period to a new deadline of 31st May, enabling additional teams to sign up. This year’s extravaganza will start on 5 September 2019 in Reims in Northern France, heading on to Stuttgart, Salzburg, Venice and finishing on 8 September in Lake Como. Entrants simply have to buy a road-legal car for under £500 (“the cheaper the car, the more fun”), dress it up and hit Europe’s greatest roads and cities for four days on a journey of a lifetime to the Italian Lakes. A series of challenges along the way “promise to deliver plenty of laughs as well as loads of fun”, however the true purpose of the event is to support three deserving charities, The Rainy Day Trust, Teenage Cancer Trust and Variety. The 2017 Rally raised over £160,000, divided equally between Teenage Cancer Trust and Rainy Day Trust. This followed an impressive £60,000 raised in 2016. The bar has been raised even higher for the 2019 Rally and Pavestone has set a target of a huge £175,000. 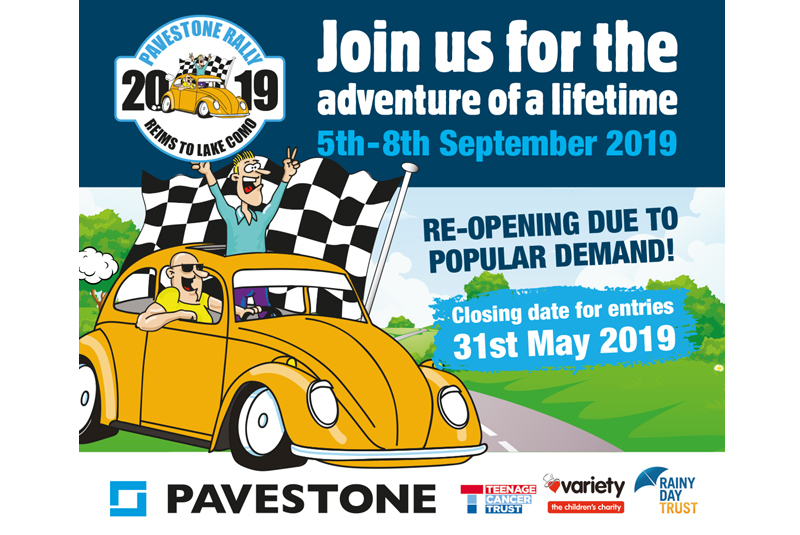 For those interested in entering the 2019 rally, visit www.pavestone.co.uk/pavestone-rally or call Aaron on 07826 867888.